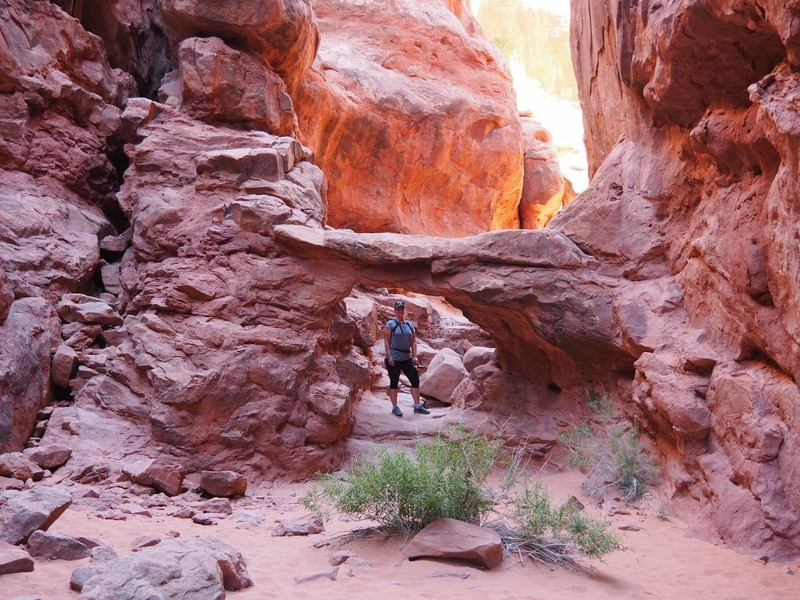 The Fiery Furnace hike is something very unique in Arches National Park. 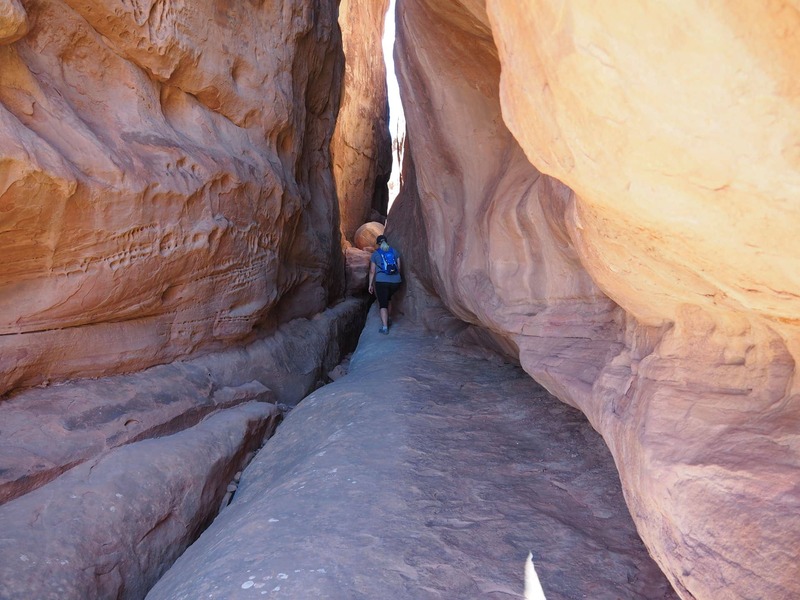 You must have a self-guided permit or ticket for a ranger led tour to enter this maze of sandstone. Tickets do sell out quickly so you do need to plan ahead for this hike. 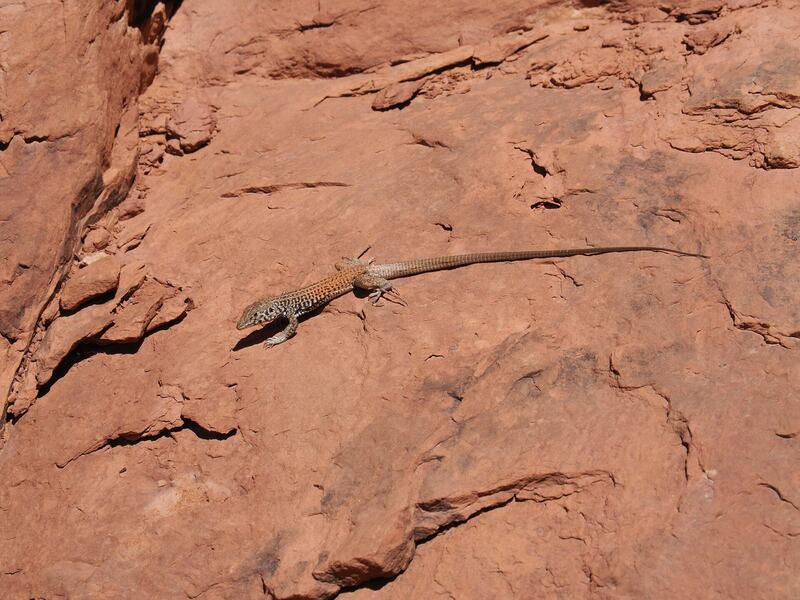 See the Arches National Park website for specific details. This trail is most often described as a maze. 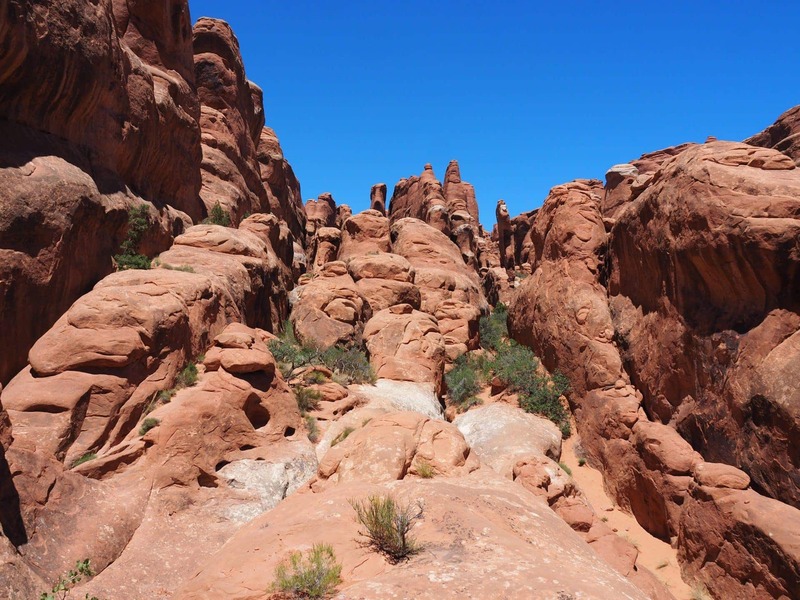 The Fiery Furnace is almost one mile long and between ⅓ to ½ mile wide. This is relatively a very small space, but because of the maze of fins, you can explore for hours on end. There are small arrow markers that outline a path, but you are also encouraged to explore more within the maze. The ranger-led loop hike is about 2.5 miles. An arch within the hike! We started by wandering around and it was so fun to explore these little passages, but eventually we veered off the path so much and was lost within the maze for quite a while. 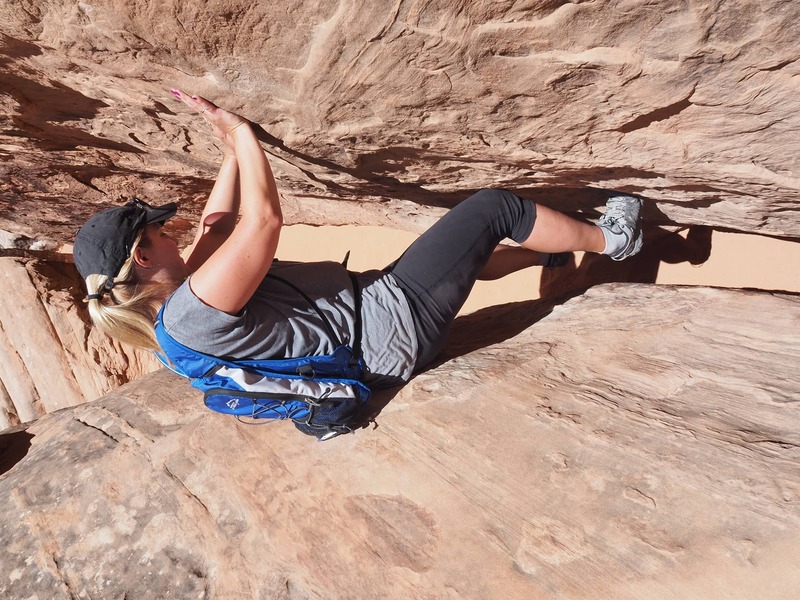 The path includes climbing over boulders, squeezing through narrow passages and even “spider crawling” so it was hard to determine the path at times. 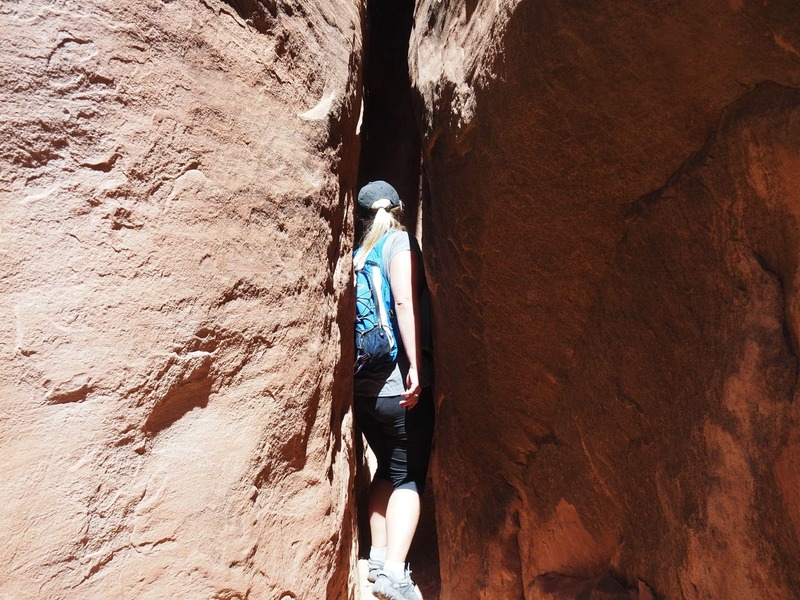 I think we made it much harder than it needed to be, but this was our first time in the Fiery Furnace so it was hard to know what to expect. There was one particular moment where we had what looked like three choices for a path, we tried each one and determined none of them were the route. This became frustrating and tiring. We overlooked the actual path for nearly an hour, which was much easier! I don’t think this is the way! 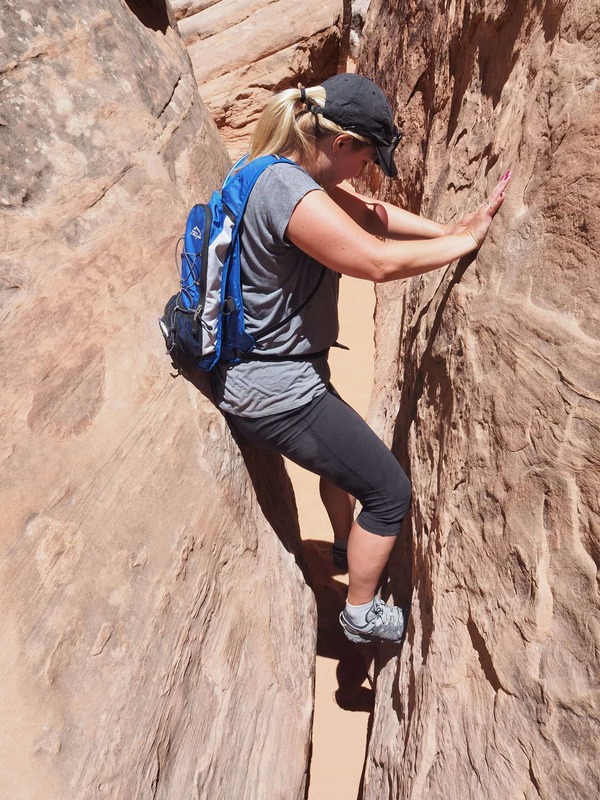 It was narrow by the ground so you couldn’t reach the bottom with your feet. Does the possibility of getting lost within a maze sound fun to you? If so and if you have some hiking experience, go for it! 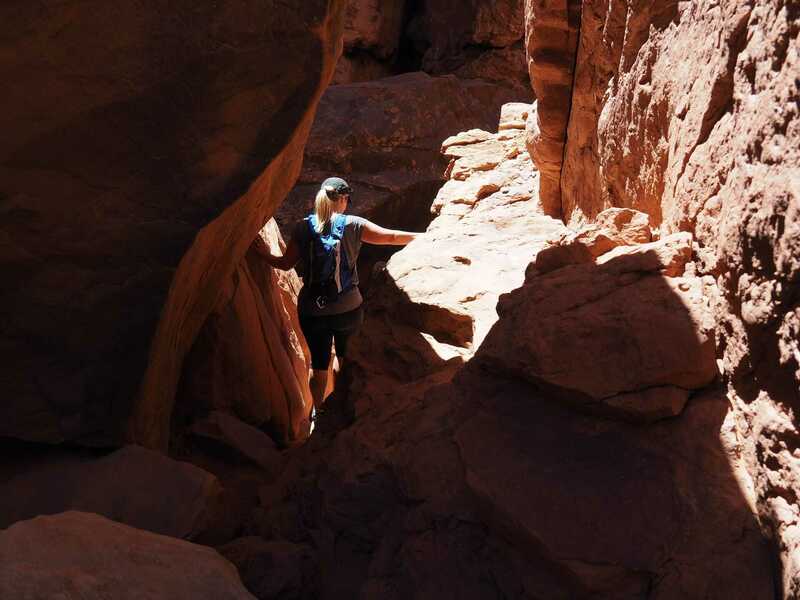 Get yourself a self-guided permit and go explore The Fiery Furnace. 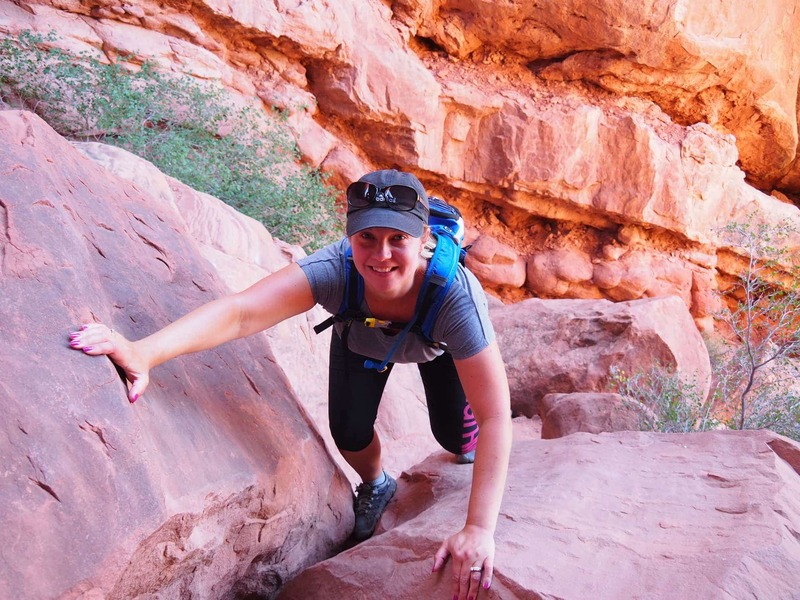 I do highly recommend this hike if you are up for a different kind of challenge. It’s unlike other hikes we’ve done and the scenery is fantastic! Not so sure getting lost in a maze of fins is your cup of tea? Plan accordingly and get on a ranger led tour. You’ll gain the knowledge and confidence to enter the maze again on your own. Keith and I checked into the River Canyon Lodge, showered off the dirt and hit the pool for an hour. We needed some time to rest and relax before dinner. I’m the kind of person who can sit at the pool all day, Keith not so much. In fact, this was the first time all summer Keith had been in a pool… it was July 1st! We ended up walking to dinner and went to bed fairly early knowing we had already had a couple busy days and we were just getting started. Keith and Renee would be arriving tomorrow morning and we had a busy agenda planned for the next 6 days!